Note: This story has been edited since publication to include a new appointment that happened after our interview with Mr. Wolf. If Attorney General Loretta Lynch can indict the head of FIFA, global soccer's governing body, then she should be able to indict the Islamic State's self-described caliph, Abu Bakr al-Baghdadi, and "Jihadi John" for genocide, said former U.S. Rep. Frank Wolf. Wolf wrote to Lynch Sept. 8 calling on her to take action. He believes that the grisly murders of Americans Steven Sotloff, Peter Kassig, James Foley and the brutal torture and killing of aid worker Kayla Mueller give the U.S. jurisdiction to try Al-Baghdadi and "Jihadi John." "Given the overwhelming and publicly available evidence of genocide, I call upon your office to initiate a thorough investigation into individuals who may be criminally liable under U.S. law for genocide and other serious human rights abuses such as slavery," Wolf wrote. "... I would urge you to announce that even where there may not be jurisdiction to prosecute under U.S. law, you will endeavor to work with foreign prosecutorial authorities to initiate criminal proceedings in countries that may have legal jurisdiction." The U.S. government has a history of indicting foreigners who kill Americans. Indicting them would send the message that the U.S. will bring those who do so to justice, Wolf told the Investigative Project on Terrorism. A five-day trip to the front lines in the region in January inspired his letter. There he saw the human tragedy first hand. Wolf, along with a group from the 21st Century Wilberforce Initiative, where he is a distinguished senior fellow, interviewed about 75 people including several Yazidi girls. The experience left him certain that the Islamic State had perpetrated genocide and believing legal action was required. After World War II, he said, the world promised to never let genocide like the Holocaust happen again. But the world did not keep its promise in places like Cambodia's killing fields; the massacre at Srebrenica in Bosnia; the Rwandan genocide and the ongoing genocide against Christians, Yazidis and other religious minorities. The Wilberforce Initiative works to enhance religious freedom throughout the world. It's a continuation of work Wolf did in the House, where he was a longtime leader of the bipartisan Congressional Human Rights Caucus, which later became the Tom Lantos Human Rights Commission. 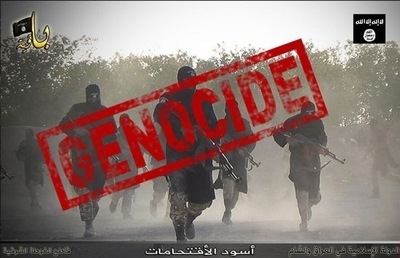 Wolf is not alone calling the Islamic State's actions "genocide." President Obama used the term himself last year. Wolf wrote a separate letter to the president in July asking him to bring the genocide issue before the United Nations Security Council. What is happening in Iraq and Syria resembles the situation in the former Yugoslavia during the 1990s, where former Serbian President Slobodan Milosevic systematically ethnically cleansed Croats, Bosnian Muslims and Albanians. Baghdadi, "Jihadi John" and other Islamic State leaders should also be indicted by the International Criminal Court in The Hague, Netherlands, Wolf said. His letter notes that the Islamic State's actions meet all of the criteria in the 1948 U.N. genocide treaty. These atrocities include: mass killings of religious minorities, implementation of a convert-or-die policy for religious minorities, sexual enslavement of Yazidi women, kidnapping Christian and Yazidi children as young as seven months, brainwashing children to be child soldiers and exiling religious minorities from their homes. But that doesn't mean America should solely leave it up to the U.N. body to bring them to justice. ISIS leaders should be hunted down and taken back to the U.S. for trial, Wolf said. "If not for crimes committed against humanity as a whole, the United States must at least seek justice for such horrific crimes against her own people," Wolf wrote. "The United States Department of Justice should be a beacon of justice and the rule of law to American citizens and citizens of the world alike. Therefore, it cannot stand by as genocide is flagrantly committed and American citizens are the victims of crimes against humanity." Thus far Wolf has not had any response from Lynch's office and is taking a wait-and-see approach with regard to her office any taking action. Wolf holds deep reservations, however, toward the administration's policies toward religious minorities. This includes the Obama administration's prior failure to highlight Christian persecution at the hands of Islamist terrorists. He took the administration to task for previously glossing over the fact the Egyptians killed by the Islamic State in Libya last February were Coptic Christians and the 148 Kenyans killed by al-Shabaab in April were Christians. "It seems that there is a sort of reluctance for the administration to say [that they were Christians]," Wolf said. He also expressed frustration with what he sees as the administration's slow walking of implementing the last bill he passed in Congress. Under that law, the president was supposed to appoint a special envoy to advocate for persecuted Christians and other religious minorities in places like Iran and Pakistan. It took 13 months for someone to fill the position. Last week, the president appointed Knox Thames to be that State Department envoy "to Promote Religious Freedom of Religious Minorities in the Near East and South Central Asia at the U.S. Department of State. The delay was frustrating, Wolf said, because the envoy "also [will] advocate for Muslims who are being persecuted. "It would be a central location for people to go for aid, like if there is a crisis, like on Sinjar Mountain with the Yazidis, where they could go to coordinate." His bill passed with bipartisan support and was co-sponsored by U.S. Rep. Anna Eshoo, D-Calif.
Loretta Lynch is a spineless ignorant puppet for the Obamanation Administration. Loretta Lynch is a spineless ignorant puppet for the Obamanation Administration. I appreciate what Wolf is trying to do but I am afraid that the politically correct and ignorant librals who have most of the power politically will just lead this nation and the world into the abyss of Islam. It will take the Republican party to help turn around the direction of playing in to the hands of Islam. I plan on voting Republican even though I am a centrist. NOW WTH SAUDI ARABIA LEADING THE HUMAN RIGHTS COMMSION IN THE U.N.?? It seems futile unless the present administration, which is what it is will stand up and be counted!!! Little will be done. One more voice "blowing in the wind"